Wholesale Flowers Ordered: 1 box Wedding Flower Combo Pack 200 Roses and 300 Carnations, 80 stems Dark Cherry Gerrondo Daisies, 36 stems Peony Rose Pink Yves Piaget and 12 bunches Purpleberry Dahlia Style Cushion Flower. 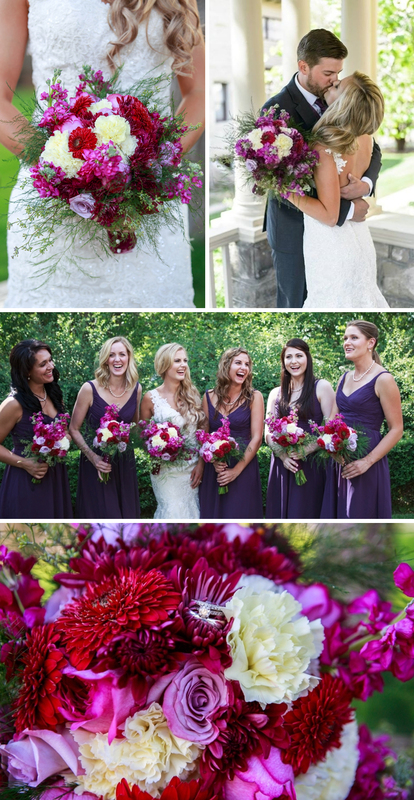 What She Made: 1 Bridal Bouquet, 6 Bridesmaids Bouquets and over 20 Centerpieces! To see Monique’s flower ratings, Click Here!